The information we collect on your behalf is for your use only. Comment Box will never share your comment cards (or the statistics derived from them) with any third party — we’re not in the data mining business, we’re in the business of Customer Comments software and we never want to put that in jeopardy! For your eyes only! Comment Box is not for public reviews! Just like an old comment box, comments are for the business owner only. Comment Box collects customer email addresses only so the software can contact a customer if they win a prize. At the customer’s option they can choose to provide their email address to you for future email marketing – but only when they specifically opt-in. In order to ensure accurate, honest feedback we must guarantee your customers complete privacy. Comment Box will never reveal the author of a comment card. At no time will you see the email address, name or any other identifying information about the customer who submitted a card. You can see the internet address used to submit the comment card. This policy is rigid (see the note above about how we never want to put our business in jeopardy). If you have any concerns or questions about how Comment Box works or how we store and use data, please contact us. It is critically important for our customers (and your customers!) to have complete confidence in how we handle data. 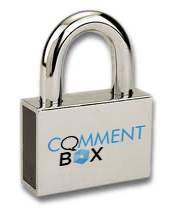 This confidence is of the utmost importance for the viability of Comment Box as a business. We do not compromise on this fact – nor will we ever compromise in the future.